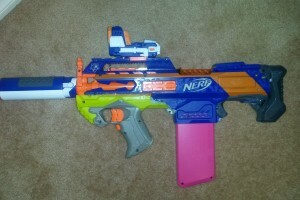 My Bullpup Rapidstrike is my pride and joy, my primary blaster and probably my best mod. 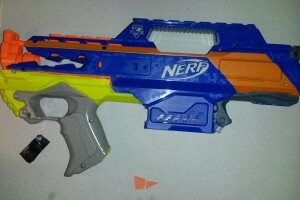 It combines the incredible performance of an overhauled Rapidstrike with the form factor of a slightly beefed up Rayven. 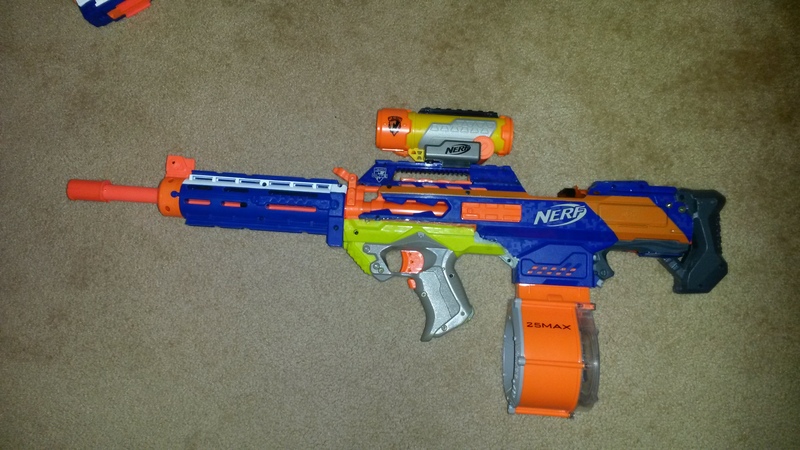 Since it is such an important blaster to me, I thought it would be the most appropriate first mod post. 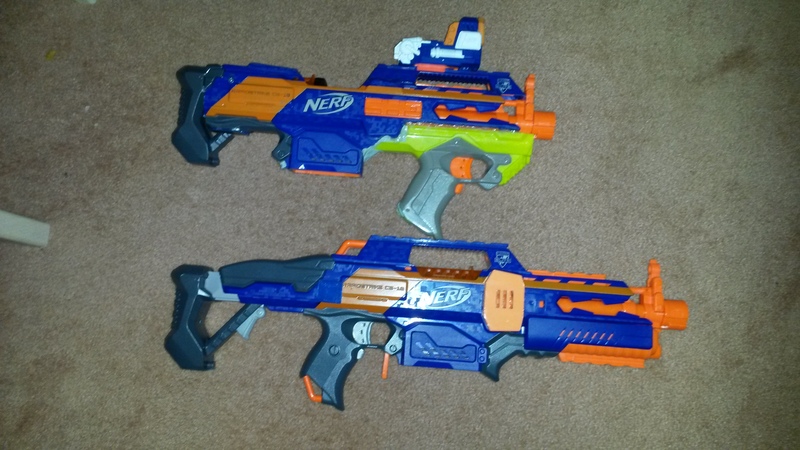 Around mid-June this year, I got a set of “Falcon 130” motors (Rhino 130s are basically the same and are currently available), an aftermarket motor that was one of the most popular at the time. I put them in one of my Rapidstrikes and powered them with a 3s LiPo (3 cell lithium polymer battery, maximum voltage ~12.6V). 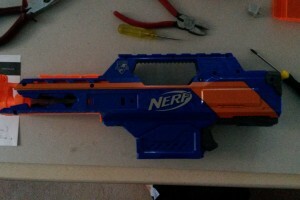 Upon first firing it I was amazed, it spewed out darts at just under 10dps, all at very high velocities. 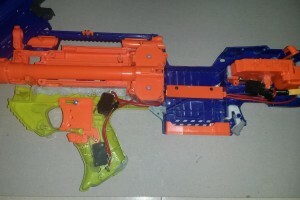 I immediately knew that I wanted a full-auto for my superstock primary. 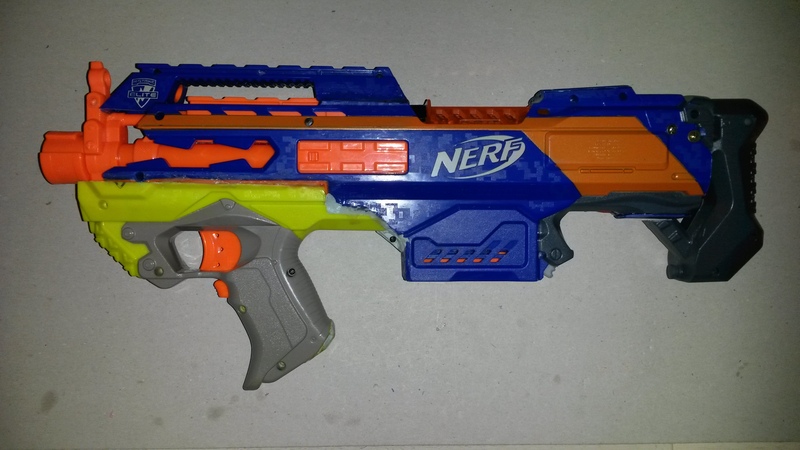 I’ve always liked the bullpup (firing mechanism behind trigger) design, I think it looks really cool, and bullpups are also typically shorter which I like. 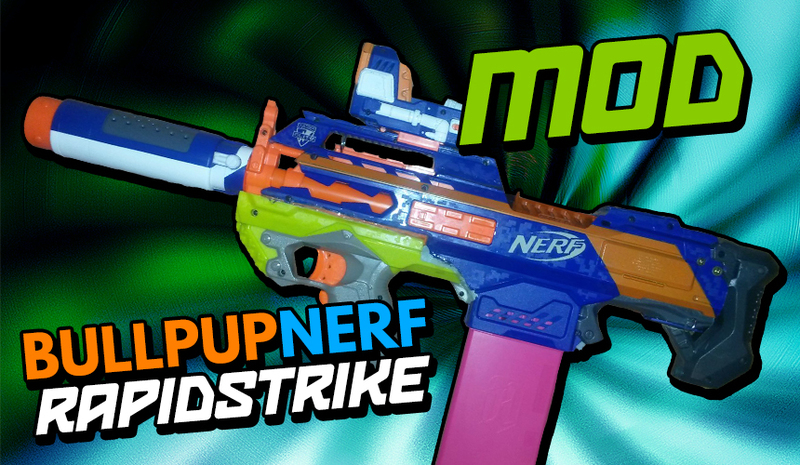 Unfortunately, Nerf’s only clip (mag) system bullpup, the Rayven, has a plethora of internal issues that particularly come to light when modding. 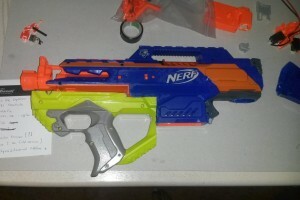 As such, I decided that the best course of action would be to reconstruct a Rapidstrike into bullpup configuration. 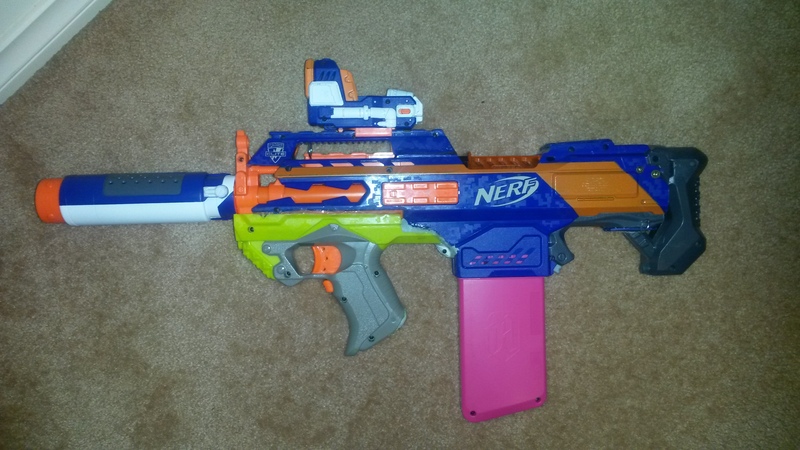 Naturally, making the conventional layout Rapidstrike into a bullpup took a lot of work. 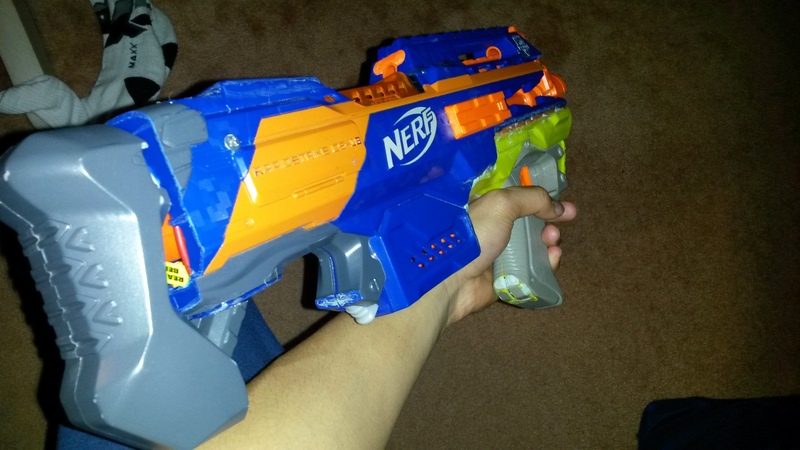 I used a sacrificial Rayven handle as I find it comfortable, and it greatly simplifies some of the work necessary. 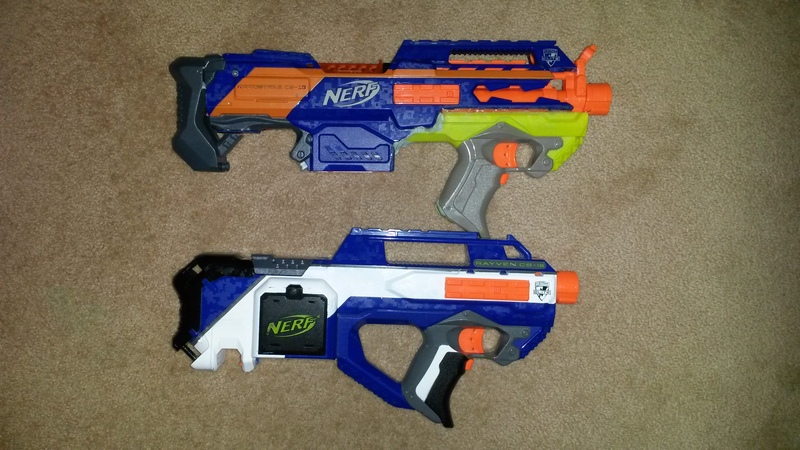 Here’s a progression of the bodywork I did for mine. 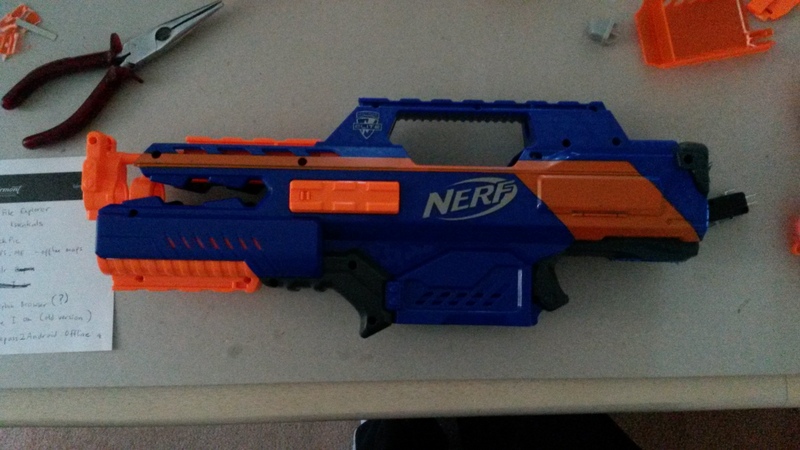 First cut, handle and stock gone. 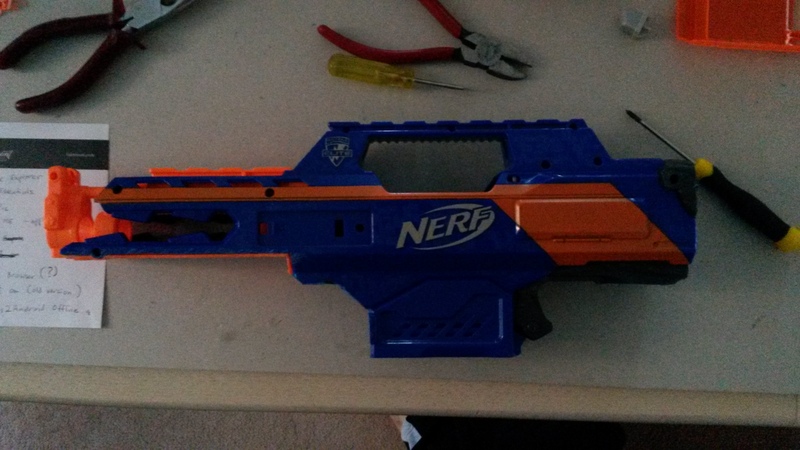 Shaping up the Rayven handle, stage 1. 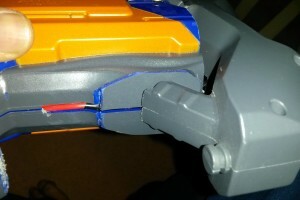 Shaping up the Rayven handle, stage 2. 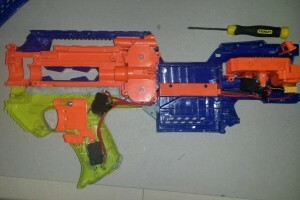 Test fit with all the internal bits. 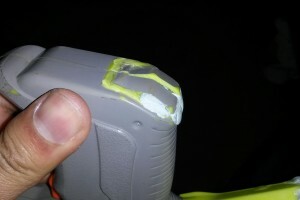 Gluing on the carry handle. 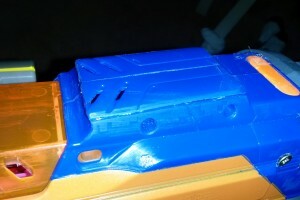 I used a combination of 3 day epoxy reinforced with 5 minute epoxy and epoxy putty for the main joins. 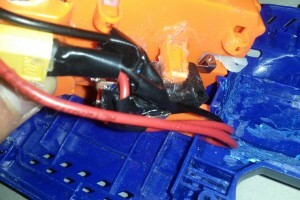 Non-load bearing joins are usually done with just 5 minute epoxy. 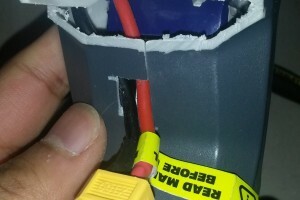 This combination of adhesives has been quite effective, it’s survived several events with significant use, with no sign of failing. 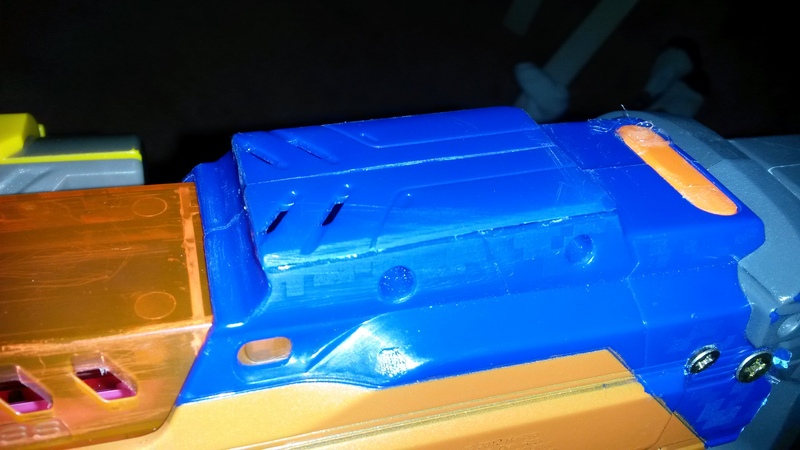 The bodywork was the most time consuming part of the mod, taking to account all the careful fitting and the curing time of the adhesives. 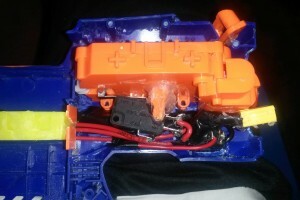 I’ve done enough electrical mods to become fairly proficient with Rapidstrike overhauls, so the internals were not too big a deal. 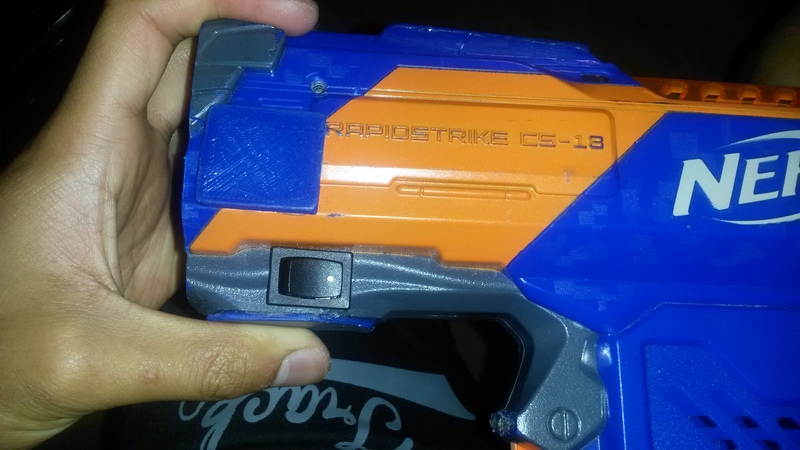 I used the same Falcon 130s and 3s LiPo from the previous Rapidstrike, which I redid with Blade 180s and a larger 2s LiPo. 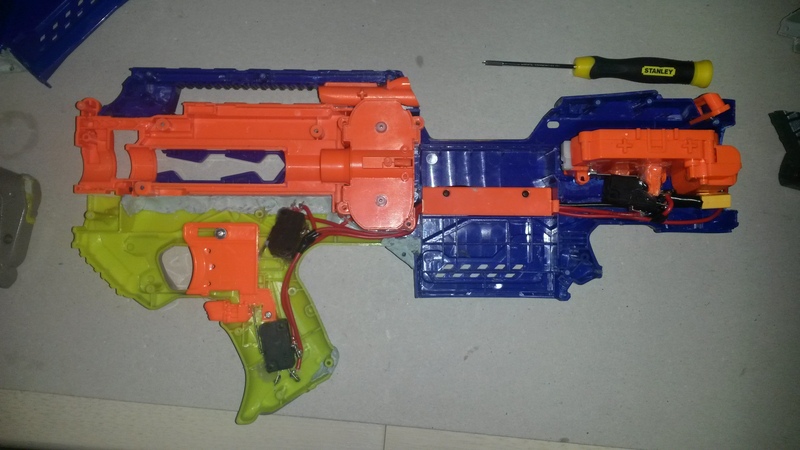 All the functional internals in. 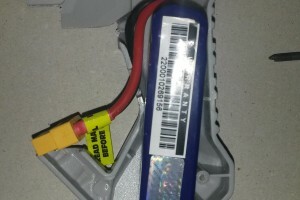 Better look at the LiPo and cable. 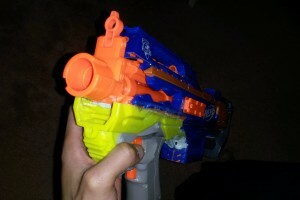 How stock slots into the blaster. 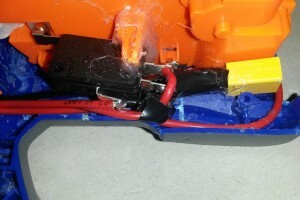 A look at the mess under the pusher box. 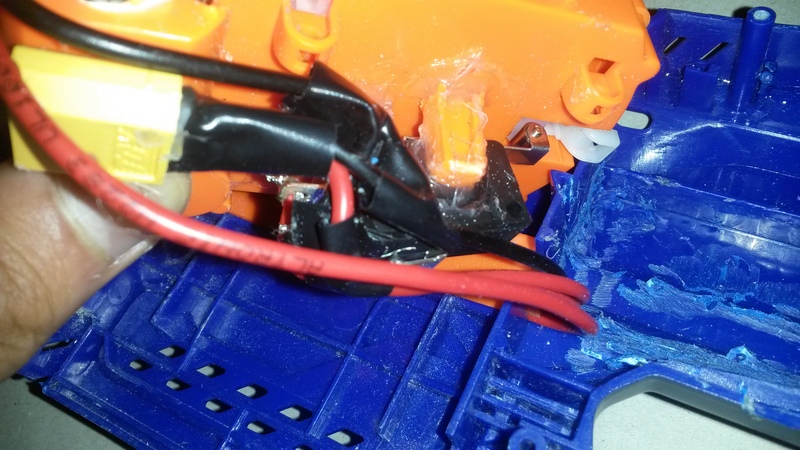 Falcon 130 in the pusher wired up. 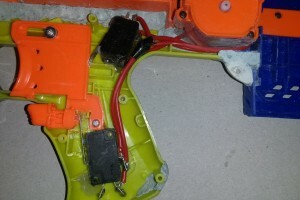 A closer look at the fire control switch + mess. 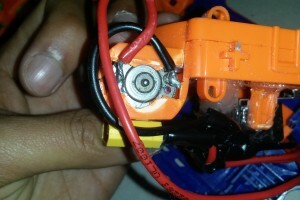 Naturally with all the cutting and moving of parts, a lot of gaps were made in the shell. 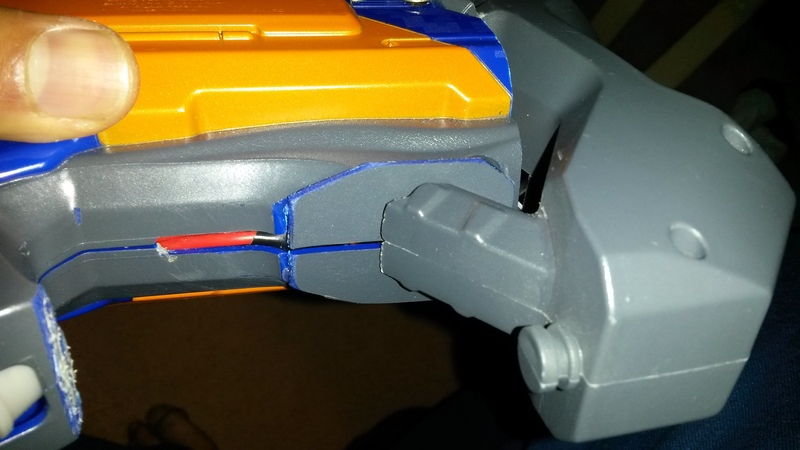 Here’s all of the major gaps and how I patched them up. 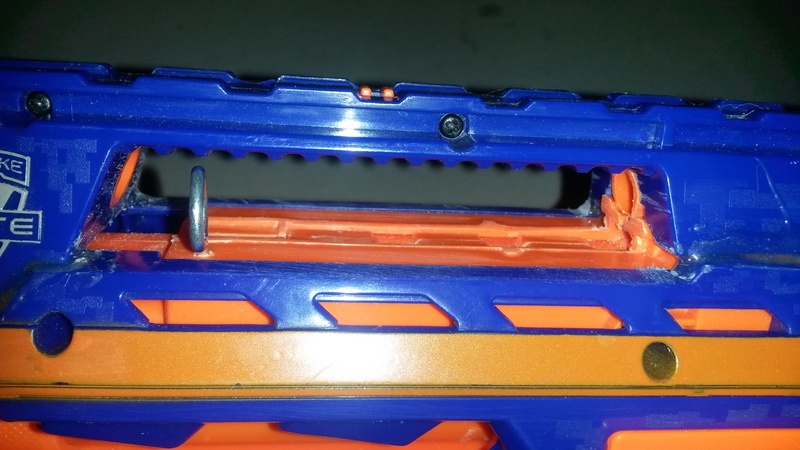 Handle gap from removing thumbhole stock. 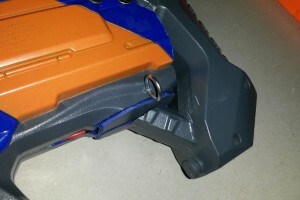 Cheek rest hole from carry handle moving. 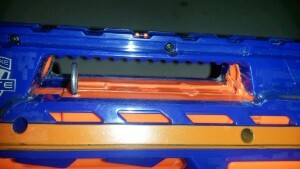 Hole from the old handle. 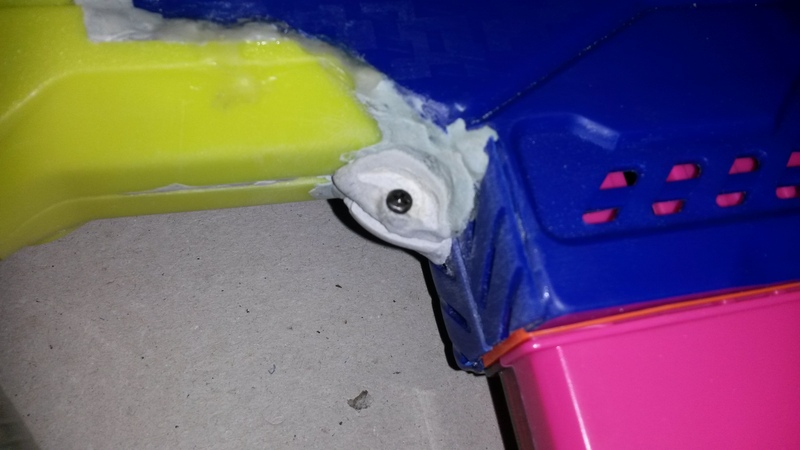 New screw port in an otherwise screwportless area. 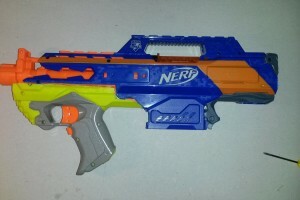 Next to a standard Rapidstrike. Here’s the Bullpup RS next to a standard Rapidstrike, it’s about the same length as a stock retracted, fore-endless RS. 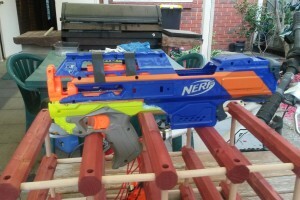 Naturally the centre of mass of the Bullpup is much further back compared to a regular RS. 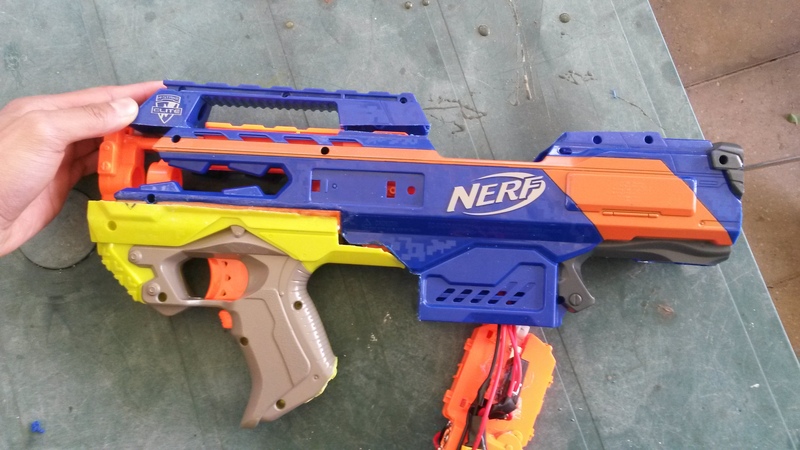 Next to an Elite Rayven. 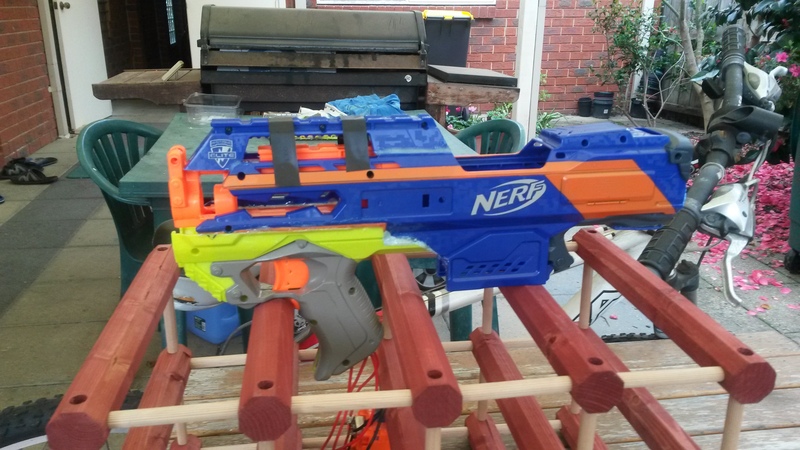 Here’s the Bullpup next to my Elite Rayven (a rare commodity in Australia). 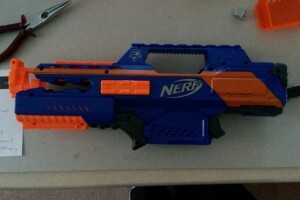 It’s only a little longer, but significantly heavier, at nearly twice the weight. Sling point at the front. Sling point at the back. 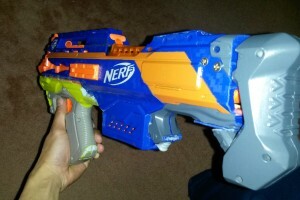 With 18 clip (mag), EPPS. 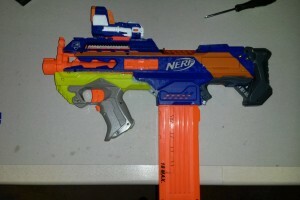 With Retal barrel, Tac Scope, 25 drum. 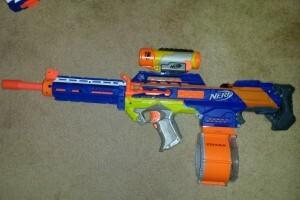 With Spectre barrel, EPPS, 12 Rebelle clip (mag). 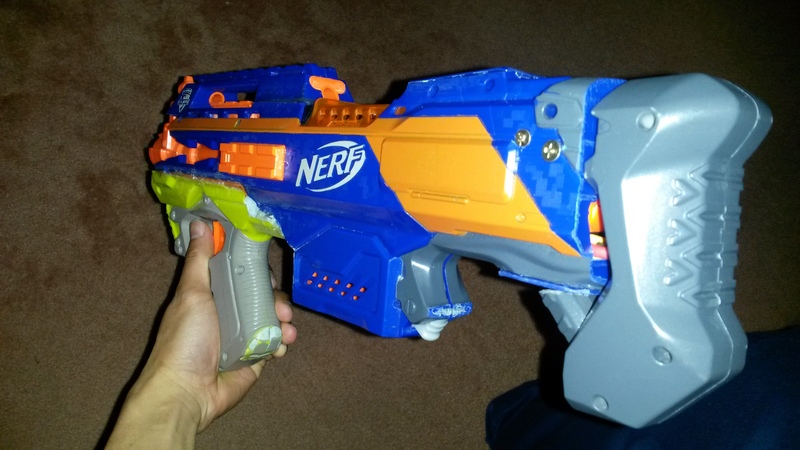 The Bullpup RS still has 3 tac rails and accepts barrel extensions, so has a tacticool ability similar to a Rayven. 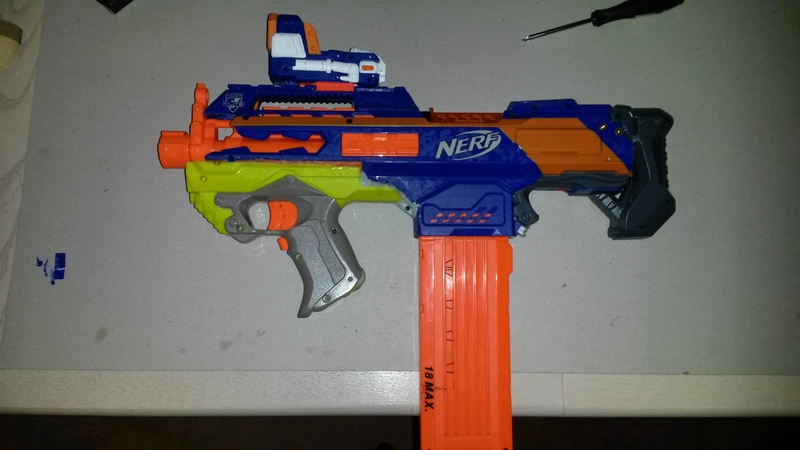 I’ve made a number of alterations to the Bullpup since the completion of the main project for various reasons, I’ll go through each one here. 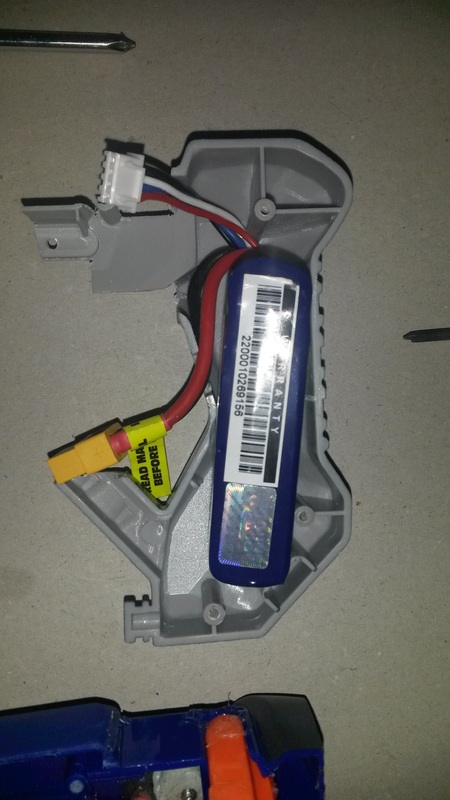 Motor cover for new motor. While Falcon 130s are very popular for general use motors, I find that they’re not great for pusher control duty. If I pull the trigger intending to stop firing, sometimes the pusher will run over and fire an extra dart or two. 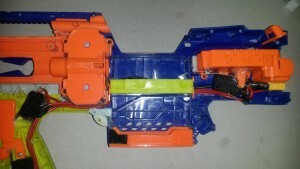 I believe this is due to Falcons having not quite enough torque. 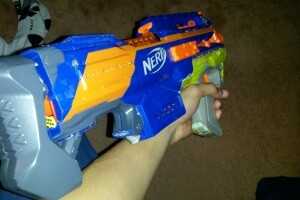 Additionally, I wanted just a little faster ROF because I play far too many video games with fast firing weapons. 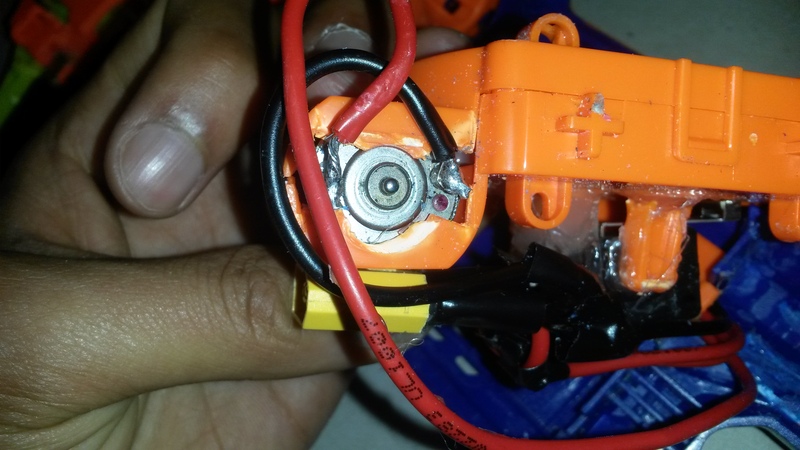 I decided to try an FK180PH-3050 motor, which is slightly faster than a Falcon, but has 2.5 times the torque. 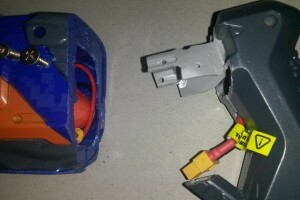 The only problem was that the -3050 is slightly longer, requiring a hole to be cut in the shell and a cover placed over it. 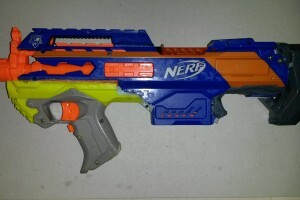 The -3050 turned out to be extremely good, it is indeed faster but has much better pusher control, I can fire 2 dart bursts extremely consistently and repeatedly. 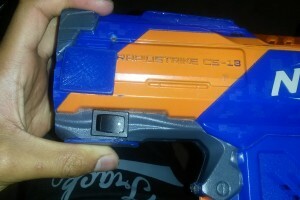 Cleared out carry handle aperture. 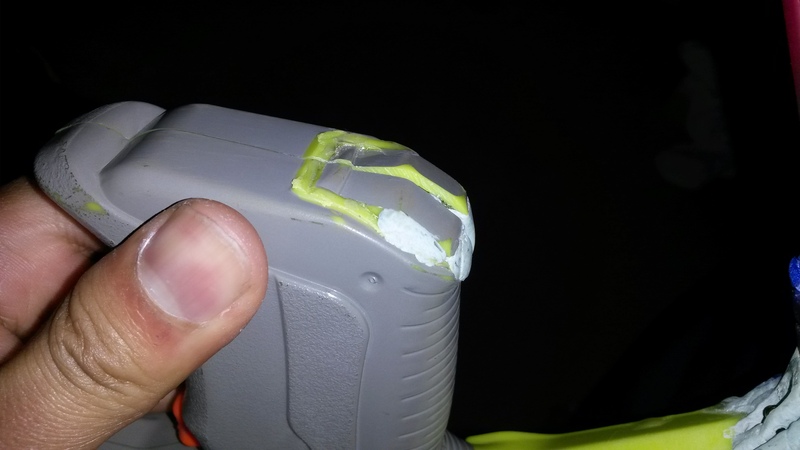 Previously the old front tactical rail got in the way of fitting my hand through the carry handle. 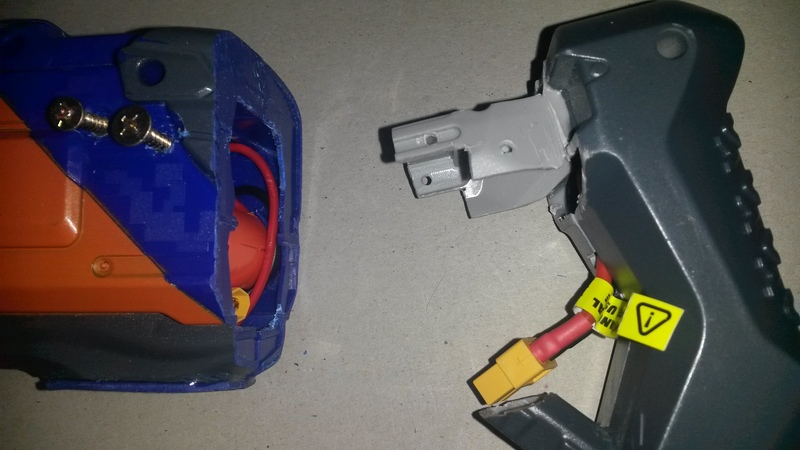 A few minutes with a saw and some hot glue fixed that. 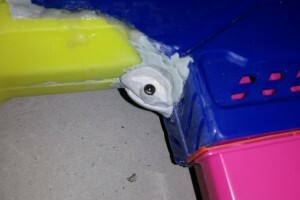 Second clip (mag) stabilising bracket (the green one). 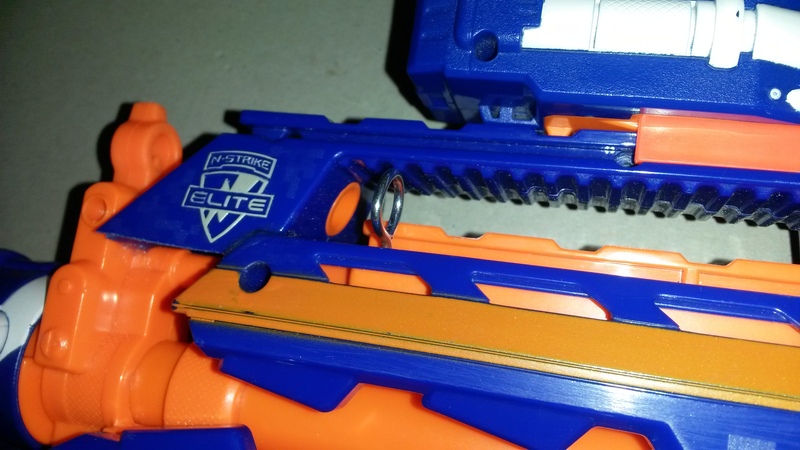 I found that the old 18 dart clips (mags) (of which I have a lot) tend to wiggle a fair bit in some of the Elite flywheelers, and the Bullpup RS was no exception. 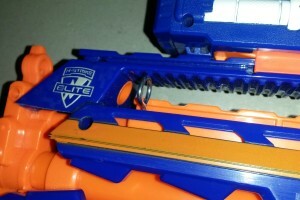 To combat this, I used the bracket from the sacrificial Rayven and fit it further up in the magwell. 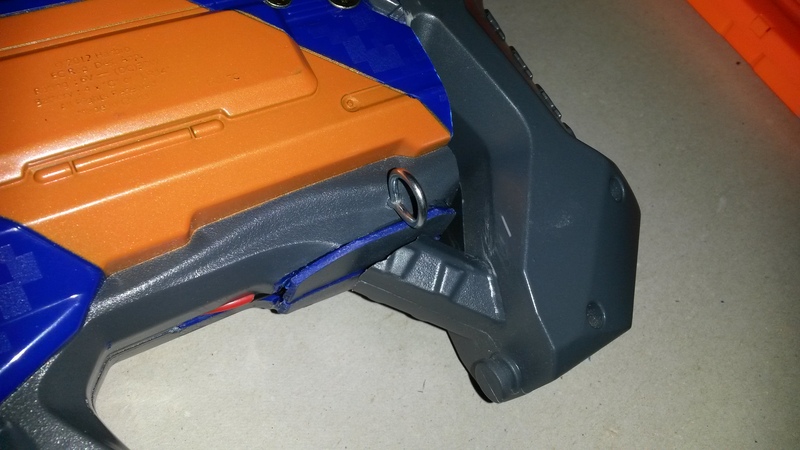 This addition does help to reduce clip (mag) wiggle quite a fair bit. 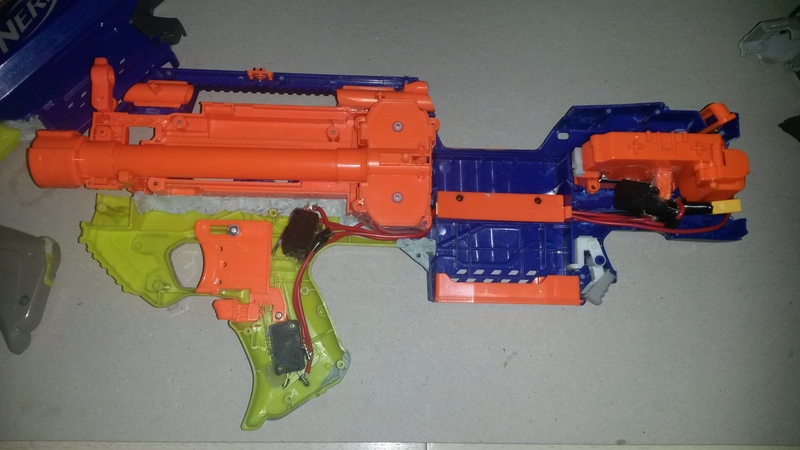 MOSFET with all the necessary extras. 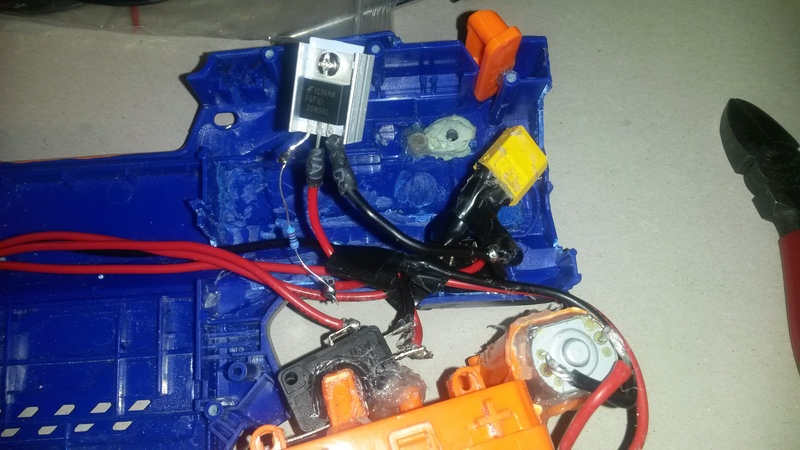 MOSFET and extras all crammed into the mess. 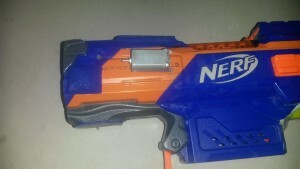 At one particular Melbourne HvZ event, the pusher decided to go full runaway, I believe due to a stuck switch. 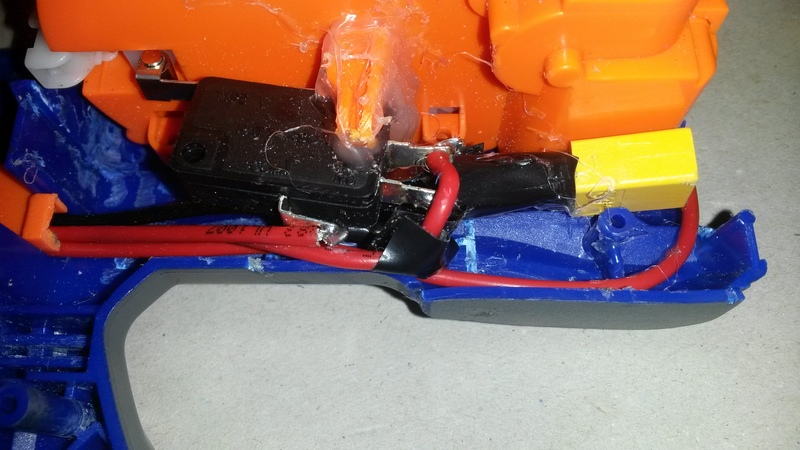 This was only stoppable by disconnecting the LiPo and then hitting the blaster trying to release the switch, which took a few minutes. 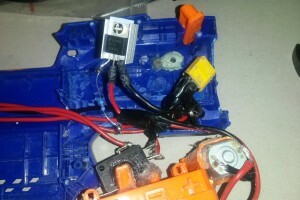 This would have been greatly simplified if there was a killswitch that disconnected the LiPo without having to remove it. However a regular switch would not do, since the blaster would be drawing up to 40A, a current that would require a very large switch to handle properly. 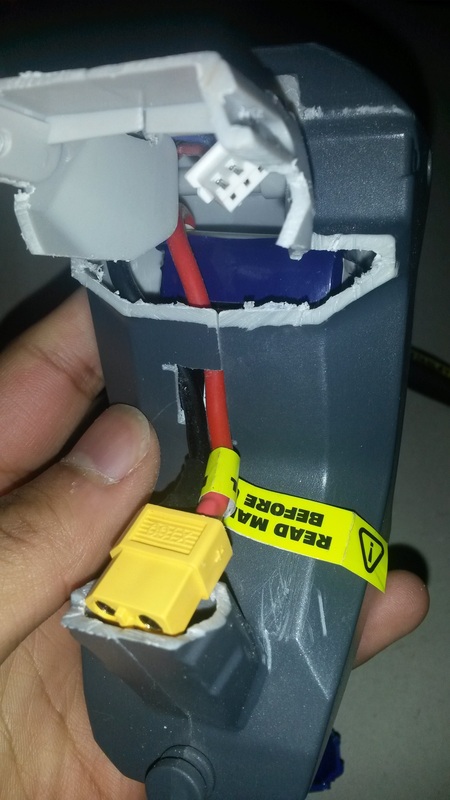 Instead, I used a MOSFET, an electrically controlled switch capable of handling quite high currents. 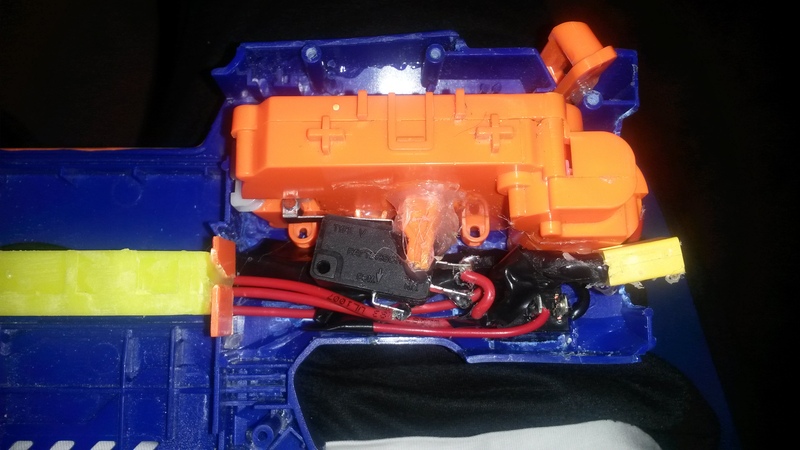 Though this did complicate wiring a little more, and add more into the mess of wires, I was able to choose pretty much any killswitch I wanted, since the MOSFET itself handles the switching. There’s just one big thing left to do: paint. 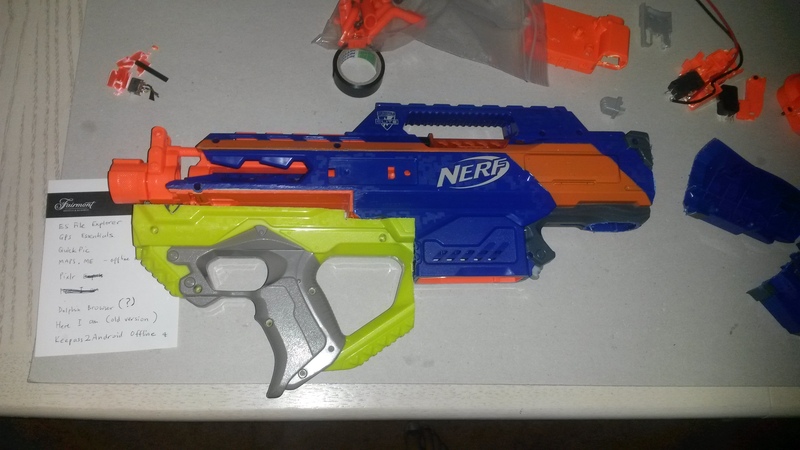 As you can clearly see, the Bullpup RS is currently unpainted, which with all the epoxy joins as well as the green Rayven handle piece looks rather odd. 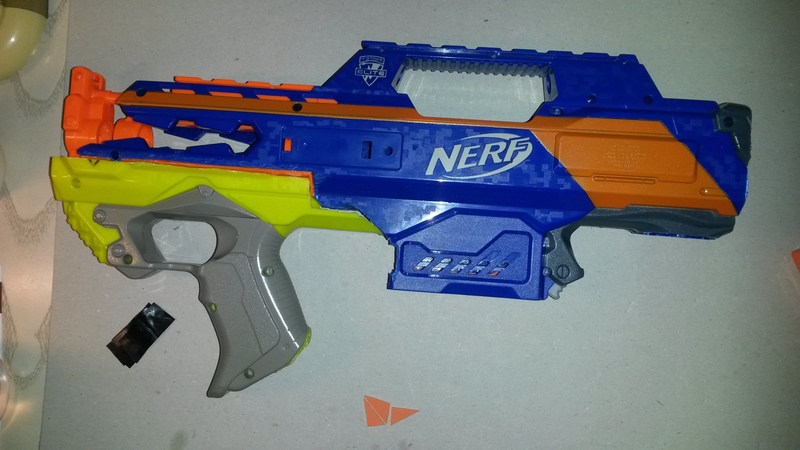 Among other things, I haven’t yet picked a colour scheme for it, and haven’t checked out the paints that I can get nearby. 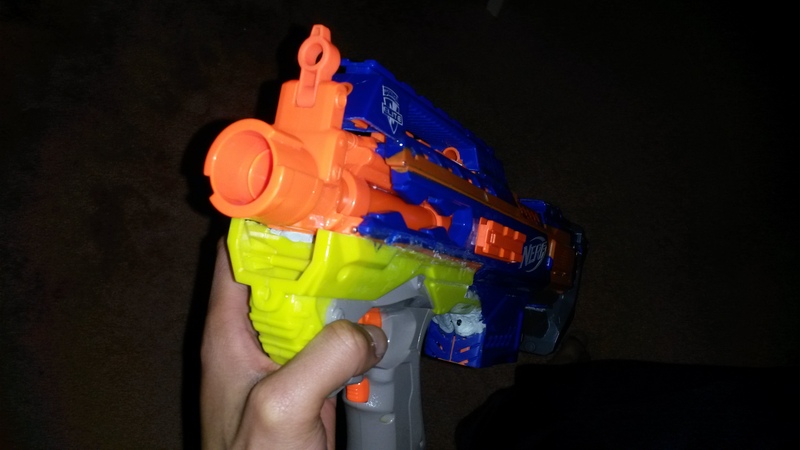 Honestly I might not get around to painting it for quite a long time, I’ll be doing a lot of practice on spare parts to make sure I don’t screw it up on the Bullpup RS. 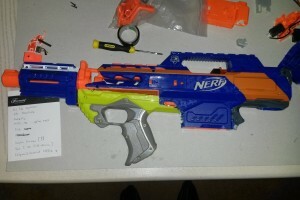 For now though, it’s functionally complete and works really well. 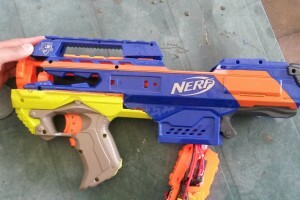 I’ve used it in Melbourne HvZ events, as well as my own games with friends, and in all cases it’s performed admirably, no different to a regular Rapidstrike. 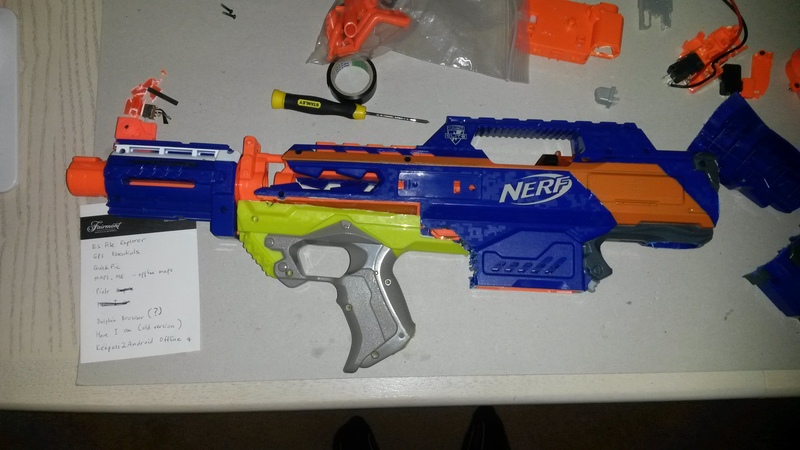 This entry was posted in Dart Blasters, Modifications and tagged bullpup, mod, nerf, rapidstrike on December 24, 2015 by Outback Nerf. Review: Buzz Bee Air Max Tyrant Media Gallery Now Available to Easily Browse all our Images! 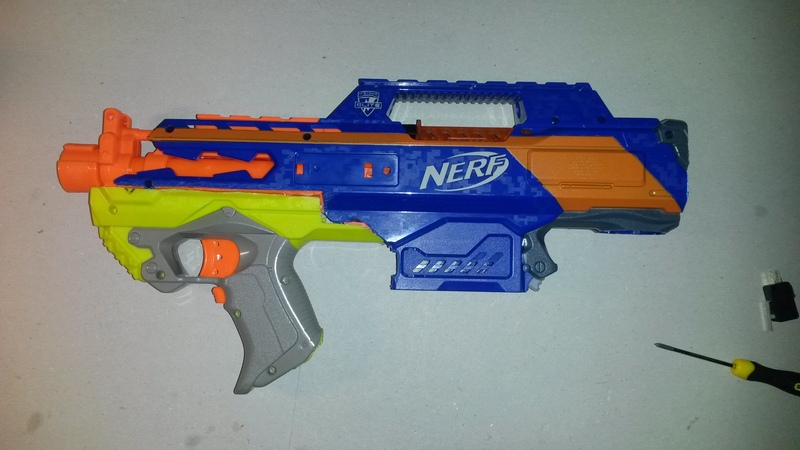 Outback Nerf, how long did this mod end up taking you from start to finish? Any idea on the number of hours? Or was it days or weeks that you slowly worked at it? The timestamps on my photos say about 5-6 weeks. 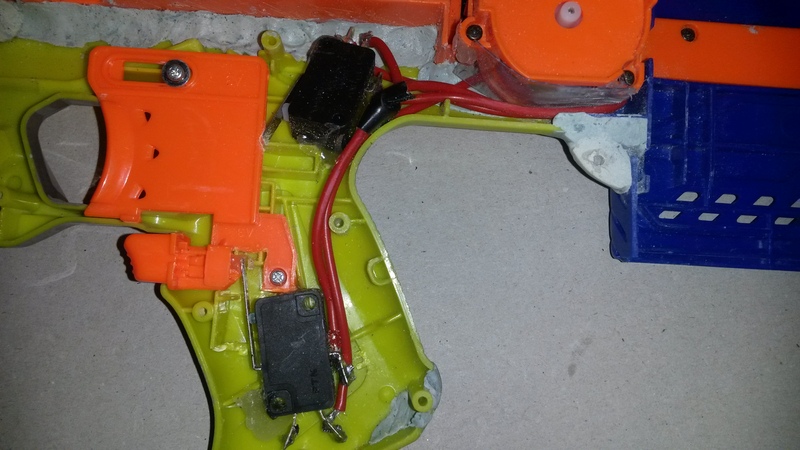 Keep in mind that because I used 3 day epoxy, there were a lot of 3 day breaks waiting for the epoxy to cure. I have absolutely no idea how many hours I spent, probably along the lines of 30+ hours or something.